The accompanying picture (Washington DC, summer 1973) is by that same French friend, Jean-Pierre Laffont. JP has been living in New York since the late 1960s. We met at the first Nixon Inauguration. I forget the exact moment, but I was a young freelancer, having just been out of college, and in DC a couple of months, and JP was the GAMMA photographer in New York, covering the USA for that then new, and ground-breaking agency. GAMMA was really the first news agency to operate on the theory that there are enough places to sell and license the work, if only we have the confidence in our photographers, and let them operate “on spec” following their own judgement. It really solidified the idea that photojournalists were journalists as much as photographers, relying on their inate skills as artists, con men, bullshitters, and business mavens, to get to where the pictures were happening, and send film of said events back to the base, in this case, Paris. After a nasty split amongst the partners, a number of the GAMMA staff left to form a new agency, SYGMA, and it was with SYGMA that JP spent the next forty something years based in New York, covering the world. (He has published two wonderful books of photographs: Photographer’s Paradise: Turbulent America 1960-1990 and New York City Up and Down (https://preview.tinyurl.com/y742hxw5) I more or less took up the GAMMA slot for the next couple of years, before leaving to start Contact Press Images (www.contactpressimages.com) in New York. 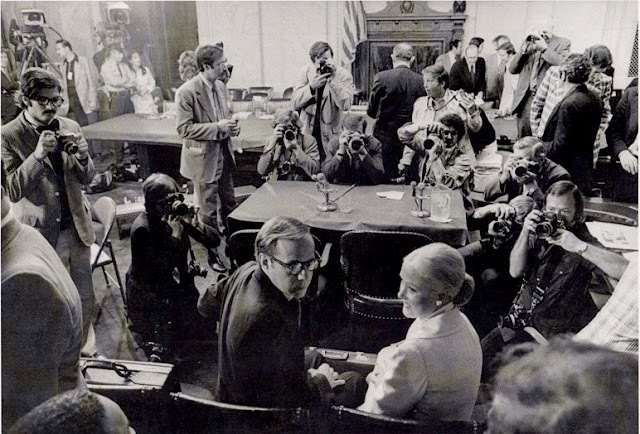 One of the first big stories I covered for GAMMA in 1973 was the Watergate Hearings and the beginning of the unravelling of the Nixon administration. Every day had a wild new twist as witnesses came to the hill, sitting in front of folksy old Senator Sam Ervin (ever the ‘country lawyer’), the country, and the world. One of the most explosive days of testimony came when John Dean, who had been the one to tell Nixon there was “ a cancer growing on the Presidency…” came with wife Maureeen (soon to be known by all as “Mo’ Dean.”) I was one of the photographers trying to make some kind of picture of Dean that day, and I was surrounded by some of the best. Looking back now, I see so many of the Washington world who have since died, but whose presence made me, a young guy fairly new at this game, try and do better than just merely showing up. When you look a t the talent in that room, and realize how widely viewed their pictures would be over that year, it gives you pause. There are a few I don’t recognize, but many I do: Daryl Heikes (UPI), Tim Murphy, Joe Silverman (Wash Star) (standing behind me), ME (GAMMA), Committee Counsel Sam Dash in the dark suit in the distance, Gjon Mili (LIFE – tall in the grey suit, the man who did things with early strobes we all marvelled at, even years later), Stanley Tretick (confidante to Presidents from Kennedy to Carter), Harvey Georges (amazing that we can identify someone by their hair – AP), and Wally McNamee (lower right, Newsweek.) I think WashPost photographer Jim Atherton, (the guy who could, and often did, walk into a hearing room where you’d been sitting on your knees for two hours, look around for about a minute, make a half dozen snaps, and walk out of the room, having handed you your very own lunch, an hour before the lunch break) might even be in this picture. I know he was in the room. In my dreary picture of Dean with hand raised for swearing in, Atherton had, alone, snuck behind him and popped up for just long enough to get the anxiious faces of the Senators. Such was the talent in that room, in this picture from 45 years ago. Forty five years, and none of us alive today can imagine it was really that long ago. Like so many things it feels so fresh, so recent, so real. We have our pictures to remember our lives, and photography, above all, is about memory. Thanks, JP. And yes, I’ll get a haircut.